Net Weight: Packet (200 seeds)1oz (1600 seeds)(+$6)1/4lb (6400 seeds)(+$11)1/2lb (12800 seeds) (+$19)1lb (25600 seeds) (+$25) This item is currently out of stock! Said to be named after the Roman General Lucious Licinius Lucullus who was �renowned for magnificent banquets�. Introduced in 1890 and still popular today. Upright plants produce leaves that are used fresh or cooked like spinach. Cut leaves 1 inch above ground and new leaves form allowing continuous harvest all season long until harvest. Plant seed outdoors as soon as the ground can be prepared. Plant in rows 18 inches apart spacing seeds 1 inch apart. Can also be broadcast in beds. Cover seed with 1/2 inch of fine soil, well pressed down. Keep thin spacing plants 4 inches apart. Silver Beet can be planted all summer long. 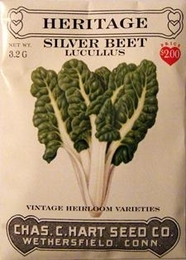 Bulk Heirloom Swiss Chard seed available.